Several of the current NHRA Sportsman national points leaders will endure some drama this weekend as racers in Division 5 and Division 2 take their best shots this weekend. The biggest event of the weekend will by far be at SRCA Dragstrip in Great Bend, Kansas as the weekend will include a both the originally scheduled Lucas Oil Drag Racing Series event along with the postponed Earlville LODRS from last month. The double weekend will give racers a chance to fill out their divisional scorecard as they chase the national championship. In addition, Division 2 competitors will have another opportunity to gain valuable points at the Silver Dollar Raceway LODRS this weekend. Brad Zaskowski, currently No. 2, is in great position to improve if he makes the trip to Great Bend this weekend. After his runner-up last weekend in St. Louis, Zaskowski sits just three points behind current leader Justin Lamb. With two divisional races left to claim, Brad could make a big move as he is improving on a 2nd round and 4th round loss. At this point, he only needs to go to the 3rd round at his next points race to take the lead but we know Lamb is not done earning points so Zaskowski needs a late round finish to put the pressure on Justin. Chris Chaney was super-hot in June through August but he hasn’t raced in over a month. With a double LODRS close to home this weekend, Chris is sure to make a charge towards the top of the standings. Just 73 points out of the lead and holding two first round losses, Chaney could easily drive his wheel-standing Camaro to the points lead with a couple of late round finishes this weekend. After almost doubling-up at the last Division 2 event earlier this month, I would expect Cooter Hidalgo to head East this weekend to Silver Dollar Raceway. With three divisional races left to claim and two second round losses on the scorecard, Cooter could be one to watch over the next few weeks. Jeff Taylor, currently No. 2, has two divisional races left in order to better a 3rd and a 4th round loss. I’m not sure which direction Taylor may be heading this weekend but he’s only one late round finish away from taking over the points lead. Jeff Strickland has an outside chance of winning the championship but he’ll need to win his next two divisional races to have a shot. I’m sure he’ll take a shot at the Division 2 LODRS this weekend. Don Nichols could easily take over the Super Comp points lead this weekend in Great Bend as he only needs 83 points and he is claiming full points in the first race of the weekend and replacing a first round loss in the second race. Barring a disaster, Nichols should make his case for the national championship this weekend. Another racer with a shot is Austin McClure. He’s 87 points out of the lead and will be looking to improve on two second round losses this weekend. With only two races left to claim, McClure will need to make the most of his opportunity this weekend. It looks like only Ray Sawyer, Aaron Kinard, and Jim Perry have a shot at catching points leader Devin Isenhower in Super Gas. Jim Perry will need to make the final round in both of his next two LODRS events to have a shot. We’ll see if he can take the first step this weekend at Silver Dollar Raceway. I wouldn’t think that Sawyer or Kinard would be in action this weekend but both have one national and one divisional left to claim. Mark Jones looks to be the only racer with any chance to catch Paul Nero in Top Dragster. After Jones won the last Division 2 points race earlier this month, I’m sure he’ll head East like Cooter Hidalgo looking to rekindle the magic from earlier in the month. While Doug Crumlich is leading the class, JR Lobner sits in the driver’s seat in the race for the Top Sportsman national championship. Lobner has three chances left to improve on a 1st and a 2nd round loss. He’ll get two shots this weekend in Great Bend. As hot as Lobner’s been over the last month, I fully expect he’ll take over the points lead this weekend. We’ll recap all of the Lucas Oil sportsman racing next week. 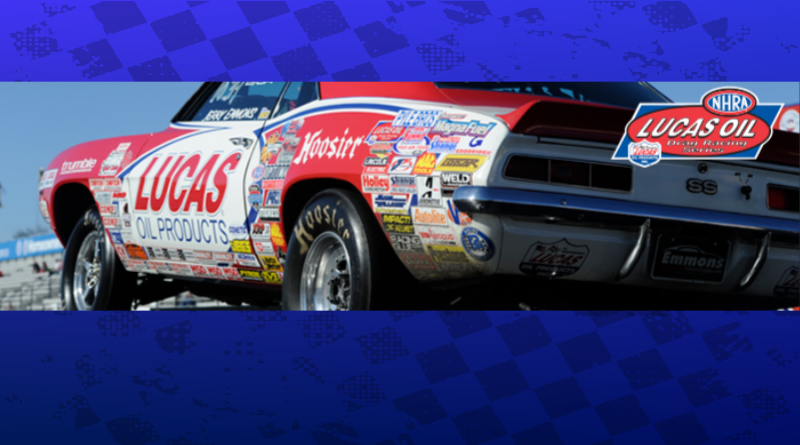 DragChamp is the source for NHRA sportsman drag racing news and drag race results, visit daily for the latest updates in the world of sportsman drag racing.